Alpro peach/exotic has a sweet and juicy taste of only the best peaches and other exotic fruit. 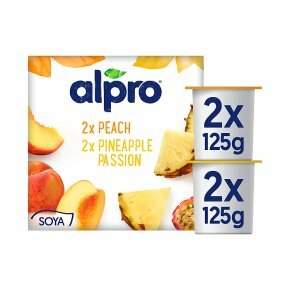 Alpro is a tasty choice if you love yogurts, made with no animal fats, just tasty plant goodness with calcium, vitamin D and yogurt cultures. Eat well- feel uplifted. NEW.100% PLANT GOODNESS.Yogurt Cultures.SUSTAINABLE DEVELOPMENT.We like to do business that benefits you and the world around us. Soya protein products use 5 times less land and 10 times less water and generate less CO²emissions than products made form animal protein. we only use non-GM whole soya beans that are not harvested in the rainforest. We don't like the thought of leaving messy footprints and continue to reduce our carbon ones, working towards totally carbon neutral factories. So if you consume our products you are doing your bit for the planet too !We all like to feel light and bouncy and set ourselves up for the day. Alpro®soya is the perfect breakfast partner with cereal, fresh fruit or by itself. Enjoy! A varied, balanced diet and healthy lifestyle is recommended for good health.